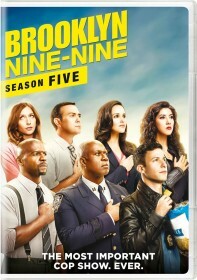 FOX has released the synopsis for the May 16 episodes of Brooklyn Nine-Nine, "Your Honor" and "The Slaughterhouse". Gina Gershon (Showgirls) and L. Scott Caldwell (Lost) guest star in the episode. "Your Honor" / "The Slaughterhouse" - Captain Holt's mom (guest star L. Scott Caldwell) seeks support from the precinct after her house is robbed. Meanwhile, Terry, Rosa and Boyle remodel the breakroom and Amy teaches Gina how to change her own car tire. Then, Jake and Rosa try to earn the respect of their idol, Lieutenant Melanie Hawkins (guest star Gina Gershon), while Charles, Terry and Gina test different parenting methods to resolve a conflict between Scully and Hitchcock in the all-new, special one-hour "Your Honor/The Slaughterhouse" episode of BROOKLYN NINE-NINE airing Tuesday, May 16 (8:00-9:00 PM ET/PT) on FOX.